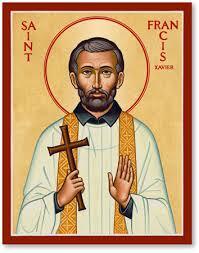 Francis Xavier was born in 1506 to an aristocratic Basque family near Navarre, Spain. At the age of 19, he went to study at the University of Paris, and by age 24, he was already a teacher of philosophy who had a promising academic career ahead of him. His life changed after he became acquainted with Ignatius Loyola, and along with Ignatius and others, he helped found the religious community, the Society of Jesus. He was ordained to the priesthood in Venice in 1537. As King John III of Portugal desired Jesuit missionaries for the Portuguese East Indies, Francis was ordered there in 1540. He landed at Goa, India, the capital of the then Portuguese colonies, on May 6, 1541. Francis had a passion for proclaiming the Gospel and he evangelized to such widely scattered people as Hindus, Malayans and Japanese. His letters reveal him as a tireless and enthusiastic missionary. Wherever he went, he lived with the poorest of the population, sharing their food and modest accommodations. He also spent countless hours ministering to the sick, particularly those afflicted with leprosy. Francis ministered for more than two years in Japan and learned enough Japanese to preach in a simple style, administer the sacraments, and establish missions for missionaries who were to follow him. From Japan he had dreams of going to China, but this plan was never realized. He died on December 2, 1552, at age 46, on his way to mainland China. On December 11, 1553, Xavier’s body was shipped to Goa and remains there still in the Basilica of Bom Jésus. He was canonized in 1622, at the same time as Ignatius Loyola. St. Francis Xavier has been called the patron of Catholic missions, and has been considered to have converted more people to Christianity than anyone else since St. Paul. Though his apostolate in the Far East lasted barely ten years, his example has inspired an immense amount of missionary activity in the countries of the Asian continent. He is the patron saint of Australia, Borneo, China, East Indies, Goa, Japan and New Zealand.